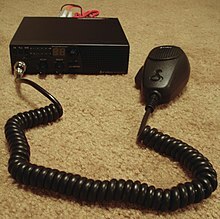 Citizens band radio (also known as CB radio) is, in many countries, a system of short-distance radio communications between individuals on a selection of 40 channels within the 27 MHz (11 m) band. Citizens band not the same as the Amateur Radio Service ("ham" radio) which has a much longer range. In many countries, CB operation does not require a license to operate. It may be used for business or personal communications. Like many other two-way radio services, citizens band channels are shared by many users. Only one station may transmit at a time. All other stations must listen and wait for the shared channel to be available. It is customary for stations waiting to use a shared channel to broadcast the single word "break" (or "breaker") during a lull in the conversation. This lets other people using the channel know that others are waiting. In the US, channel 19 is most often used by truckers. Channel 9 is reserved for emergencies. The citizens band radio service originated in the United States as one of several personal radio services regulated by the Federal Communications Commission (FCC). These services began in 1945 to permit citizens a radio band for personal communication. In 1948, the original CB radios were designed for operation on the 460–470 MHz UHF band. There were two classes of CB radio: "A" and "B". Class B radios had simpler technical requirements, and were limited to a smaller frequency range. Al Gross established the Citizens Radio Corporation during the late 1940s to manufacture Class B handhelds for the general public. In the 1960s it became popular with taxicab companies to communicate with their drivers. In the 1970s it became popular with people and truckers using it in their vehicles. The popularity was sparked by CB radios and the jargon used in several movies. Truckers in particular began using it to warn other truckers of police speedtraps. 10-4 (ten-four) meant message received. 10-9 (ten-nine) meant please repeat your last message. 10-10 (ten-ten), transmission complete, standing by. 10-20 (ten-twenty) means your location. Often shortened to "what is your 20?" 10-27 (ten-twenty seven) I am moving to channel ____. 10-200 (ten-two hundred) means police are needed at ____. Today it remains popular with truck drivers. It is used in rural areas by a wide variety of people and businesses where cellphone service is weak or unreliable. CB radios are also used by off-roaders to communicate between drivers in a group of four-wheel drive vehicles. It is used to warn drivers of various trail conditions, hazards, and delays. CB radio is used as a system of short-distance communications between people in many countries. Nearly all use a system of 40 channels in the 27 megahertz or 11 meter band. ↑ 3.0 3.1 "What is a CB Radio?". NewsMax. 6 December 2010. Retrieved 16 May 2016. ↑ 4.0 4.1 4.2 4.3 4.4 4.5 4.6 4.7 "CB Radio Frequencies & Channels". CB World. Retrieved 16 May 2016. ↑ 5.0 5.1 Patrick Haggerty (1 October 2012). "An Off-Road Driver's Guide to Cb Radios". FourWheeler Network. Retrieved 16 May 2016. This page was last changed on 5 February 2018, at 07:12.